Spirit of Justice Park. Image created with Google Maps. This article was first published in May 27, 2014. We're publishing it again because it's still interesting! The South Capitol parking crater is undeniably one of DC’s most inappropriately underused plots of land. 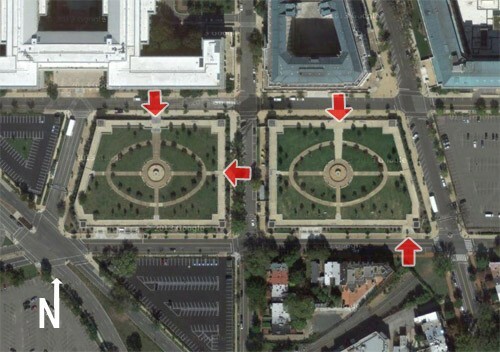 It’s six complete blocks of parking lots, all in a cluster mere steps from the US Capitol. The sidewalk in front of the park. Image created with Google Maps. Entrances to Spirit of Justice Park. Image created with Google Maps. Small trees and a dry fountain hidden behind a wall. No people. Image by the author.